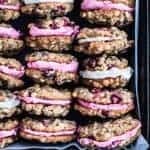 These festive fresh cranberry, white chocolate, and oatmeal cookies are soft and chewy and slightly crispy around the edges, stuffed with a cranberry cream cheese or vanilla mascarpone that takes these colorful goodies over the top!!! Remove batter into a large bowl and fold in fresh cranberries, white chocolate chips and oatmeal. Bake for 15 minutes. Cookies will look underdone and still pale, but this is what you want! Allow to cool on baking sheets for 10 minutes before transferring to wire racks to cool completely. Put the cranberries, granulated sugar, and water to a simmer in a saucepan. Lower the heat and simmer the cranberries, uncovered, for about 15 minutes until they’ve popped and the mixture is quite thick. Let cool slightly. While the cranberries are simmering, combine cream cheese and butter in a food processor with the dough attachment (or use a standing mixer if you have one unlike me) and cream until light and fluffy, about 2 minutes. Add in powdered sugar and vanilla extract and whip for an additional 30 seconds. Add the cooled cranberry mixture to the cream cheese and whip for an additional minute. Combine Mascarpone (or cream cheese) and butter in the bowl of a food processor with the dough attachment (or use a standing mixer if you have one) and cream until light and fluffy, about 2 minutes. Add in powdered sugar and vanilla bean (or vanilla extract) and whip for an additional 30 seconds. Assemble the cookies by slathering about 2 tablespoons of frosting on the flat side of one cookie, then sandwich with the flat side of another cookie! Repeat with remaining cookies. Use all a combo of both frostings, just one or none ~ your choice! Be sure to use old fashioned oats, not steel cut or any other variety. Cranberries love to roll around when you’re trying to chop them. Use a large cutting board and be on your toes for escapees. Let the cookies cool completely before frosting. Warm cookies will make an oozing frosting mess. It’s crucial that you’re using room temp butter, mascarpone, and cream cheese for the frosting. If any of those ingredients is too hard and cold, the frosting won’t whip up properly and won’t become light and airy.